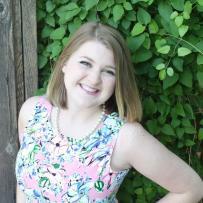 Who is the chicken queen of Crawford County? Crawford County is known as the “Chicken Capital of Kansas.” Boasting six finger lickin’ chicken eateries in the county it is easy to see why. 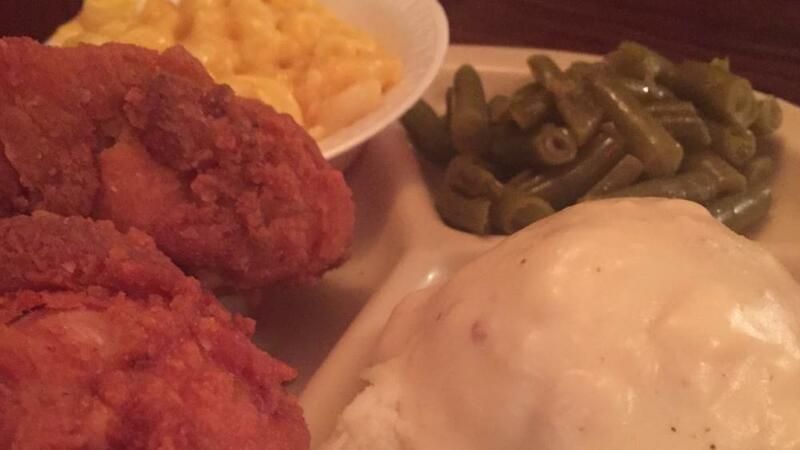 Though each of these dining establishments offers delicious fried chicken with all of the fixin’s, it’s fair to say the two restaurants compared the most often are Chicken Annie’s and Chicken Mary’s. Established just 10 years apart and located nearly 400ft from each other on an otherwise bare strip of highway it’s hard not to wonder what the difference is. 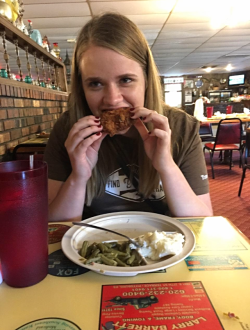 On a recent road trip, my fellow Kansas Tourism intern, Lisa, and I decided to give them both a try and decide for ourselves who’s fried chicken really is king. Lisa and I first heard of the great chicken debate from friends who attended the nearby Pittsburg State University. 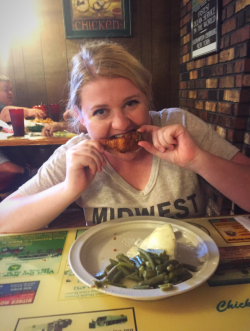 During our days at the office Lisa and talked about how much fun it would be to go the them both and compare them, so when we decided to take a road trip through southeastern Kansas we made sure to put both restaurants on our itinerary. After a full day of traveling, we were excited (and hungry) as we pulled into Chicken Mary’s parking lot. 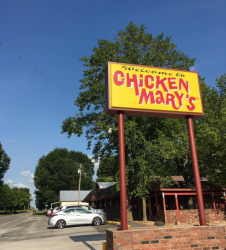 A little background on Chicken Mary’s according to the Kansas Sampler website, in the early 1940s Joe and Mary Zerngast started serving chicken out of their home. As time went on and the popularity of Mary’s chicken dinners grew the couple expanded to an actual restaurant. In 1966, the restaurant was moved to its current location and maintains close ties to the original business. We were greeted with the sound of 50s music playing in the parking lot. As we walked inside we encountered a sign expressing their special of the day, chicken fried steak. Both Lisa and I were tempted to order it, but in order to judge fairly we decided to stick with what both restaurants are famous for, fried chicken. Once sat down, I couldn’t help but notice the restaurant felt as if you were sitting in someone’s living room. Our waitress brought us a basket of bread with butter as Lisa and I poured over the menu. We decided to split a two-piece chicken thigh meal so that we wouldn’t be to full when we went to the next stop. We were allowed to pick out three out of a pretty long list of sides. We decided to stick with comfort food and ordered green beans, macaroni and cheese and mashed potatoes and gravy. Our food appeared quickly and we barely got pictures of the plate for this blog before we started digging in. The chicken was moist with a flavorful breading. The sides were good, both Lisa and I agreed the macaroni and cheese was by far the best one on the plate. As we were finishing up our food, you could tell the dinner crowd was starting to trickle in. As folks sat down to order I eavesdropped to hear what frequenters Chicken Mary’s like to order. For nearly everyone chicken was the entrée of choice. When it came to choosing sides locals tended to choose the more unique sides such as spaghetti and the Mary’s special German cole slaw and potato salad. We hopped back into the car and almost entered the Chicken Annie’s in the GPS when we realized it was quite literally next-door. According to Chicken Annie’s website, in 1934 a mining accident disabled Charlie Pichler and his wife Ann began serving dinners in her home to coal miners on Saturday nights to supply some income. Annie’s got so popular that the family had to add on rooms and even eventually move out of the house. It wasn’t until 1972 that Chicken Annie’s moved out of the house and into their new location. 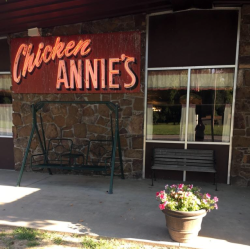 Today, Chicken Annie’s continues to be run by decedents of Charlie and Ann Pichler. We stepped out of the car and once again we were greeted with the sound of 50s music playing outside the restaurant. We stepped into the restaurant and once again couldn’t help but feel like we were in someone’s living room as there were pictures of the Pichler family on the walls and couches that could be sat in while waiting for a table. Our waitress sat us down and handed us a couple of menus. We didn’t have to spend much time looking at the menu for two reasons. First, it was quite similar to the one at Chicken Mary’s down to the spaghetti and German cole slaw and potato salad. Second, in order to maintain fairness, we knew we would be splitting a two-piece dinner with green beans and mashed potatoes and gravy (dinners here are served with two sides and macaroni is not on the menu). As our server came back to take our order she dropped off a basket of bread and butter. After all the miles driven and the chicken consumed we were still left with one question, which one was better? We are not the first people to ask that question and we definitely won’t be the last. Our long car ride home was spent discussing both places and eventually both picking a favorite. Let me preface this by saying both restaurants are very similar. From their backstories, to their food, right down to the kind of music that plays in their parking lot. There isn’t even much of an economic difference when it comes to the two places. But in the end everyone’s got a favorite and in this particular instance, Lisa and I did not come up with the same answer. Lisa preferred the crispiness of the breading at Chicken Annie’s to the flavorful breading at Chicken Mary’s. She also thought both the green beans and the mashed potatoes and gravy had a better flavor. When Lisa thought of which place she would like to go back to again, though she wouldn’t mind either one, would be inclined to choose Chicken Annie’s. When it came down to it, it was all about the chicken for me. Since it was the dish both the restaurants use in their name I weighed it quite heavily. Though the breading at Chicken Mary’s was not as crispy as Chicken Annie’s, the seasoning in it was impeccable. I will admit the green beans and mashed potatoes lacked flavor in comparison to the chicken, but the macaroni definitely made up for it and making it the perfect comfort food trifecta of sides. In the end it doesn’t matter which you choose, a great meal is to be had at either establishment. Mostly the choice comes down to personal preference. Though there will always be the question, “which is better?” Competition is the last thing I will think of when I think of Chicken Mary’s and Chicken Annie’s. I will think of two women who lovingly open their homes and kitchens to feed people the foods they loved to make, and how their legacy lives on though these two restaurants, their descendants and their customers.